Kazimir Malevich's "Black Square" (1915) receives glitch treatment - perceived as "desecration" - and perhaps embraced by this Suprematist if he were alive today. Suprematism is based upon "the supremacy of pure artistic feeling" (sensation), and the kinetic glitch treatment enhances these emotions via pixel reconfigurations, the introduction of color fields and movement. The sound component complements the feeling. This video piece could be viewed as Neo-Suprematism. 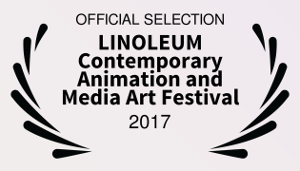 Experimental Animation and Video Art Program, LINOLEUM International Contemporary Animation and Media-Art Festival, Ukraine, September 28 - October 1, 2017.